This story is here to tell you about Nathan's Story and his courage and show you how one young boy can make a BIG impact on childhood cancers through your donation. 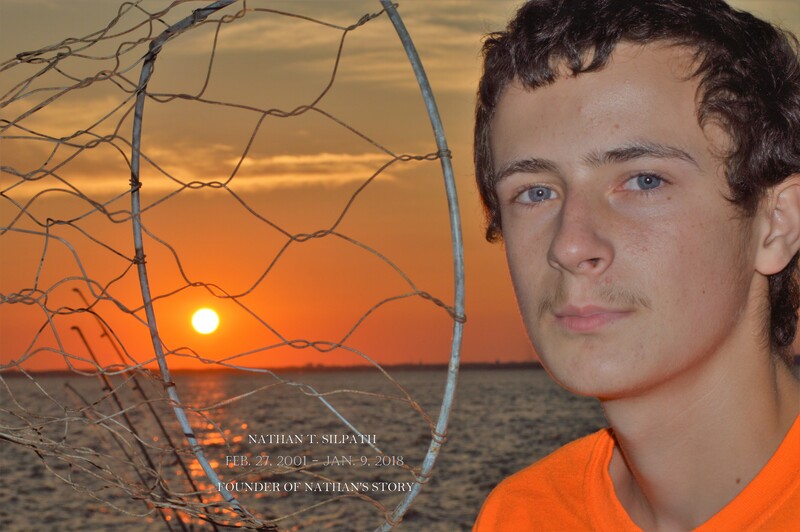 Nathan's Story is a 501c3 organization. At Nathan"s Story we wanted you to understand the difficulties of what happens when a family is faced with this life threatening disease called cancer. So many families have had to face this heart wrenching reality of being diagnosed with cancer, and as you read Nathans Story you will see his strength and that he is able to see through his own difficulties and take a look at the bigger picture about others facing cancer. Even though Nathan has been diagnosed with Osteosarcoma (bone cancer)twice, he has been encouraged to help others with cancer. This is how this organization came into existence. His hope and ours is that you will allow him to see the good that can come from people coming together to fight this terrible disease. Nathan's story of one boys courage to fight for others with cancer. 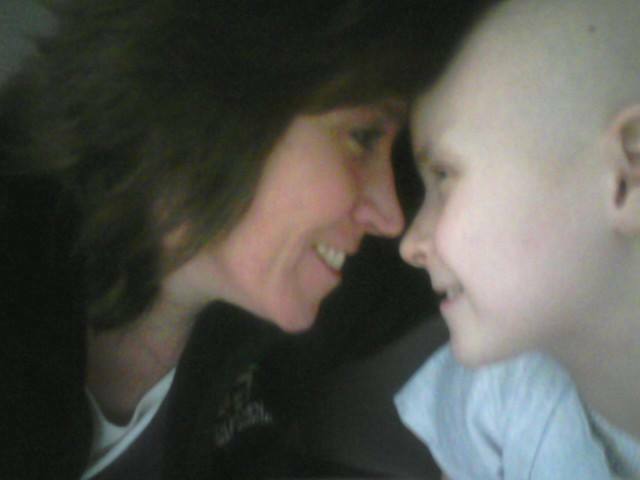 Nathan was diagnosed with Osteosarcoma (bone cancer) on Nov. 19, 2010. He started chemotherapy at AI DuPont on Thanksgiving of 2010 and has been handling it like a trooper. Our family has been spending endless day and hours at DuPont . This has been very difficult on our family. We have another son who is in his senior year of High School. Being a senior and dealing with the stress of what you will do once you graduate is already enough of a challenge, but for him having to cope with his little brother being diagnosed with cancer was what topped all of that... He has also been feeling alone because of all the time we spend up in the hospital with Nathan's chemo treatments. Nathan's chemo was scheduled as an in-patient treatment. When everything went according to plan it is almost tolerable. As we have all learned through this process, nothing goes according to plan. Nathan can would get sick at any given moment and end up back at the hospital in moments. Nathan could not attend school for fear of getting sick. Not only that, but his treatments took up all of his time. When he was not getting chemo he was fighting to keep his blood counts up high enough just to have a good day. Nathan was able to have a friend over to keep him company or play, but that did not happen very often. There has been ups and downs in our family as we have dealt with this nightmare of a situation, but we are a tight family and we have managed to overcome all the hurtles that have tried to impair us. The first week in February of 2011 Nathan underwent surgery on his leg to remove the tumor. This operation consisted of part of his Tibia being removed, where the Osteosarcoma was located. They also removed some of his thigh for connection purposes and replaced it with a prosthesis, taking their place which includes the knee joint. This sounds terrifying for anyone to go through, but Nathan at age 9 only heard one thing. What he heard was that he would never be able to play soccer again. Nathan is very proud of the awards he earned during his time playing soccer and is always eager to tell you stories about his fantastic soccer maneuvers. He has one championship trophy and three participant medals. Nathan continued back into high dose chemo until the end of July 2012 and was making a great recovery and comeback still participating in physical therapy three times a week at the hospital where he was also very involved in different events to help raise monies for the foundation at the hospital; he never turns down an opportunity to help out. Nathan had been pulled out of school for the 2010-2011 year to undergo the treatments and recover from the surgery, and even with all he is going through would like to help other people who have cancer. He has joined "The American Cancer Society's, Relay for Life" as a team member of Going for the Gold, Nathan went on to do so well that he took the award for the most individual raised at the relay. Nathan's goal in life has always been to make sure everyone was having a good day. He has had his own problems as every child does growing up but his problems never come first. He has always set his own problems aside and takes the time to make sure everyone else is "OK", as long as they are having a "good day" then he can too. Nathan had an opportunity to return part time to school, the 5th grade and as time went on he became winded and noticed he was not able to participate in physical activity as well as he had been. He was not able to do the physical activity he'd been doing consistently for some time. After many more tests and different departments the problem finally showed it's face, the cancer had returned. The tests showed cancer in his right lung and surgery was scheduled and the tumor was removed. Nathan's Doctor's still had to place his port for chemo, and while there the Doctor checked the left lung as well. He had a gut feeling and eventually his fear would prove to be correct. Nathan was diagnosed with metastatic bi-lateral lung cancer. This means the hard tumor bone cancer was growing in his lungs, it is like having stones in your lungs. This changed the chemo plan as the cancer was aggressive and resisting treatment he had already underwent. Nathan went back into chemo again. For us only to hear partly through the course that the chemo was proving to have hardship on his organs and in order to "possibly" give Nathan a chance at a normal life without organ transplants we had to stop treatment. We had to decide between his organs and the cancer. Giving that he had the surgery and Doctor felt comfortable that he had gotten all that was to be found at the time, we stopped the chemo to save his organs. When Nathan heard he had cancer again, his reply was like no other. Nathan insisted there had to be a change and asked if we could be part of that change. If we could start an organization to help children and families and research, he wanted to be a help in every area he could help. So our journey began to become Nathans Story Childhood Cancer Organization. It took some time but with the help of a friends and her boss, a lawyers office. Her boss insisted that he would help only if he could as his gift to the organization. We have become Nathans dream, Nathan's Story Childhood Cancer Organization, we are a 501(c)(3) non-profit for childhood cancer. Nathan continued his hard work in school maintaining high honors, a 4.3 GPA and focusing on his health and getting stronger; he played varsity Golf with his local high school getting his varsity letter and pin as a freshman. From an invite from a fellow osteosarcoma warrior and a great friend Nathan joined a Sled Hockey team Delaware Sled Snipers and going to the championships with them several times and bringing home to the cup. We pulled him out of public school due to it not being a great fit and started him on a full home school program where he would attend private home-school classes, which he absolutely enjoyed to no end and worked very hard on being a kids his own age. December of 2016 we went for a routine oncology follow up appointment and found Nathan labs were at an all time low, he had minimal platelets, red blood cells and his whites were low as well, Dr was in hopes this was just a virus and we monitored for 4 weeks when it showed no signed of recouping doctor and I (Mom) agreed we needed a bone marrow biopsies done something wasn't right. From those bone marrow biopsies Nathan would be diagnosed in 2017 with a secondary cancer known as Therapy-Related Myelodysplastic Syndrome (t-MDS), in Nathan's case this would be a blood cancer related to Acute Myeloid Leukemia (AML). This cancer came from two of his earlier high dose chemo-therapy treatments, Cysplatin being from his original diagnosis in 2010 and Ifosomide bring from his relapse with Osteosarcoma in 2012. These are not your common chemo-therapies that cause secondary cancers, although they run the risk as do many of them. This secondary cancer proved to be extremely difficult to treat and deal with, his Dr's were in contact with a multitude of Dr's from across the United States and the treatments just were not there for Nathan, who had already been exposed to a lot of high dose chemo-therapy treatments to begin with, his organs were of big concern and he was in need of an Bone Marrow Transplant, we needed to get him to that point which was his only hope of beating it all together and surviving. Nathan's chemotherapy treatments would vary from one to the other, each one being able to show some success from first rounds, and if not we moved onto another and nothing was working, we needed to gain control of the cancer cells before they evolved. Nathan was put into studies to help make that happen. The doctors came up with a cocktail that was a long shot but worth the try and to all our surprise this would put Nathan into remission (words we had never heard through all of this starting in 2010), we needed to get into the transplant ASAP. Through the course of time Nathan was going through all his chemo-therapy treatments, the search was on for his bone marrow donor. Doctors exhausted all the resources within the United States and extended out to the world...problem was Nathan had a ethnic gene in him that was preventing a donor from being found, it came that there was no donor to be found for Nathan worldwide. Bone marrow registries/donors for all ethnic population are extremely low and in desperate need of registrants/donors. We were all carefully tested and compared and none of us were a match they needed, Nathan's father had the closest numbers and he was to be used as a last resort...We found ourselves in that exact situation that we needed to go to our only hope and our last resort and use Nathan's father, he was only a partial match and a HAPLO BMT would have to be done, this ran great risks of other complications, but the scales were being weighed and the opportunity was NOW, and so we proceeded. Nathan's labs showed he was in total renal failure, in less then a day in a half from great levels that Wednesday to total renal failure that morning of Friday January 5, 2018. With the aggressive t-AML diagnosis and full renal failure there was no more for Nathan, he was totally ready to continue his fight but his young body just couldn't take no more; seven in a half years of fighting cancer starting at age 9; Nathan peacefully passed away at age 16 on January 9, 2018... a day etched in our minds forever. Our mission at Nathan's Story Childhood Cancer Organization, is to help other children and families where they need it most, internally; bringing smiles to these children and their families is extremely important, as most children spend countless days/admissions in the hospital getting treatments and so on. We'd love to be able to help one day with expenses, bills (yes very different from typical expenses), needs: for the child going through the struggles, as well as helping aid in donating towards research to better our children's chances of surviving long term with less side effects from the chemo-therapies that are offered now. Childhood cancer is the number one killer in our children today, with majority of the treatments being 20-30 yrs old and stemming from adult chemo-therapies at a much higher dose, we need to be able to offer our children something more hopeful and positive. When the children are done with their treatments, their fight is not over, most children will undergo some sort of major illness/side effect from their treatments from the least life threatening like infertility to more severe like heart failure, organ failure, transplants, secondary cancers, and etc.. Nathan's Story C.C.O. wants to help make that difference. There are many opportunities for research but the funds are seriously lacking, the biggest donors and supporters are those who have been stricken by the disease itself and have learned as we did, first hand how much help childhood cancer needs to give our children a better chance to not only beat the disease but to be able to live a full and fun filled life afterwards. With your help, determination and donations we can help make that difference!!!. "One child diagnosed is one too many"
Please help us and Nathan support this cause by donating to Nathan's Story Childhood Cancer Organization. Nathan is a typically smart child that likes to have fun. Nathan is a lot like most boys of his age. He loves soccer and video games and Nascar. His favorite Nascar driver is Jimmy Johnson, as you might be able to tell by now. Nathan also builds legos. He has completed a vast amount of projects in his down time, even though they can become an expensive hobby. Help Nathan help others with cancer. Nathan is such a trooper. Even with all he has been through he still wants to help other people that have cancer. His courage is commendable and his strength is amazing. Please join us in making his day bright. He watches his ticker on his donation page each day to see if anyone else has donated, because he knows what the money can do for people with cancer. His unselfish act of raising funds for other children, families, and research. The funds that are raise go towards helping childhood cancer patients, and your donation can do so much to help. Even if each person that hears of Nathan's quest only donated one dollar, we could make a huge dent in this fight to save lives. This can be a truly amazing gift to a young boy who has been through so much and has such a great dream. One day there will be a cure and no parent nor child will ever have to hear those horrifying words; "Your child/you have cancer." This page was designed by Kathy Florent of Chestertown Maryland. Her design SEO and marketing stratagies have helped to make this web site possible.